Capping off a busy day chock-full of KitKat news, Google has just released a new build of Android 4.4 to the AOSP servers and various recent Nexus devices. The new build comes in at version KRT16S, and it replaces the older KRT16O build. The KRT16S update is currently available for the Nexus 4, Nexus 7 (2012 – all variants), Nexus 7 (2013 – all variants), and Nexus 10. 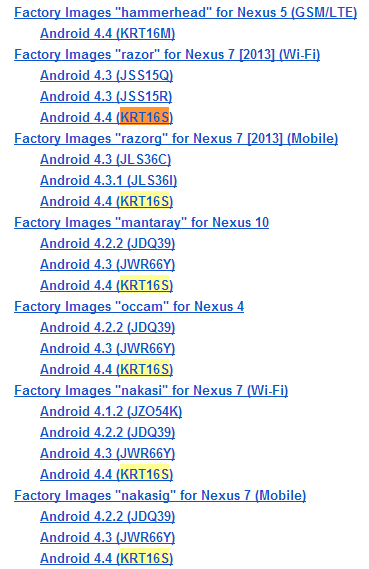 Curiously left out, however, is the Google Nexus 5, which features a different build altogether (KRT16M). Also of note, this new KRT16O build is unrelated to the mystery KOT31B build seen a week and a half ago on the Chromium Issue Tracker. According to AOSP Moderator Conley Owens, the new build is largely a bug fix build. As such, you shouldn’t expect too many user-facing features. That said, users looking to get in on the action can easily do so by going to the Nexus Factory Images page and downloading the latest firmware images. If building from source is more up your alley, head over to the Android Git and Nexus Driver Binaries page.